How Long Has Humanity Been Visiting Relatives? Thanksgiving marks the beginning of the holiday season here in the United States. This last chunk of the year is commonly known for lots of food, presents, and family traveling long distances to visit one another. Over the years visiting folks from far away has helped strengthen familial bonds, exchange new information, and spread the practice of recipes, songs, stories, and beyond. Humanity has been doing this for quite some time though. Let’s use this upcoming holiday to dig into a great science question: How long has humanity been visiting relatives? Listen to this Question Your World radio report produced by the Science Museum of Virginia to find out. Thanksgiving, much like many other holidays, involves bringing people together from all over the place, but we’re simply following in our ancient ancestors footsteps here. Keep in mind that at one point, our species was much smaller in numbers. Some say we were down to just a few hundred individual humans due to the stresses of climate, predators, and territorial disputes with other hominid species. 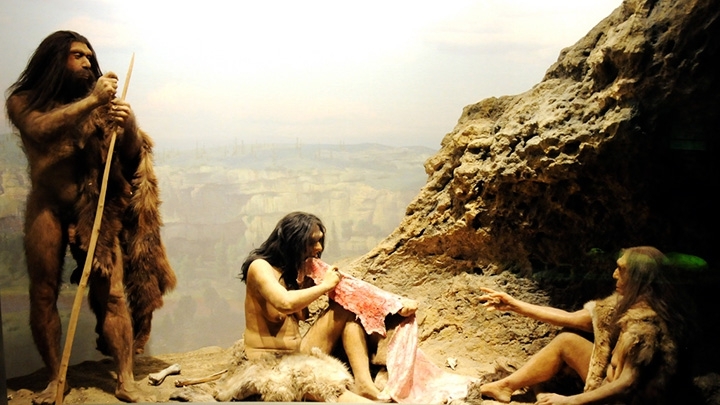 While we may have had plenty of relatives, visiting them may not have been top priority due to the survival issues that early humans were constantly facing. Regardless, at some point we started traveling back and forth to visit other humans and thus built the foundation of what we see world wide today. Thanksgiving is just one holiday of the many celebrated around the world that involves brining people together. It turns out that humans simply love getting together and will use a myriad of reasons to make these long journeys happen. Weddings, holidays, births, and so on have been bringing people together for ages. A recent study of ancient tools is giving scientists a new look at how some of our oldest relatives would also travel long distances to interact with each other. Scientists looked at tools from 59,000 to 66,000 years ago to better understand the changes in tool design over the years. Interestingly enough, a different site located about 180 miles away had very similar tool designs there too. Both sites have ancient designs featuring small blades and backed tools while other areas in this time period tend to have tools that have larger blades and pointy features. The tools found in these two distant regions indicates that those two communities would frequently interact and this is where knowledge on this style of tool making would have been exchanged, opening up possibilities on many other cultural interactions as well. So, yes, we travel a lot to see one another these days, but visiting relatives is something that we've been doing for quite some time now! While these visits had nothing to do with thanksgiving, this study does further support the notion of how distant communities interacting with each other was certainly a somewhat regular occurrence back then. Working together and keeping up with communities near and far helped our ancient relatives survive and flourish, perhaps something to consider if Thanksgiving conversations get heated. Remember, we’re all in it together folks! From all of us to all of you, happy thanksgiving everyone!